Engineering isn’t a one-size-fits-all proposition. We can customize nearly everything we sell, from modifying housings and mechanical interfaces to fine-tuning performance parameters. Interested in custom assemblies? 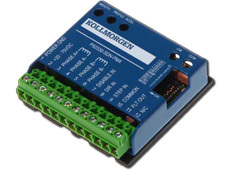 Motion Solutions partners with best-in-class providers of controllers, drives, and motors to offer a comprehensive selection of motion control products in a range of sizes, performance levels, and technologies. With this broad product portfolio, we support customer needs across a variety of different industries. Our Engineered Solutions group works with these motion control components every day. We have deep familiarity with our product lines and long-standing relationships with the factory engineers. Combined, this gives us the expertise and the connections to help customers choose the ideal products for their systems, whether those are commercial off-the-shelf units or customized items tailored to a specific application. At Motion Solutions, we have the tools and expertise to get the job done.